Yellow, yellow...you've kissed a fellow :) Spring colored ensembles and matching accessories new in the shop! ~Fun in the Forties Find this fun 1940's play suit by designer Louella Ballerino. Ballerino's interest in casual, fun clothing led her to design a variety of garments, all suitable for the "patio lifestyle". Find adorably flirtatious handbags to match. ~ Fall, leaves, fall; die, flowers, away; Lengthen night and shorten day; Every leaf speaks bliss to me Fluttering from the autumn tree. ~ Grab this matching autumn outfit in the shop today! Items priced @$65 or less! Spring colored ensembles and matching accessories new in the shop! Find this fun 1940's play suit by designer Louella Ballerino. Ballerino's interest in casual, fun clothing led her to design a variety of garments, all suitable for the "patio lifestyle". Find adorably flirtatious handbags to match. Lots of cute holiday jewelry added to the shop. All under $20! 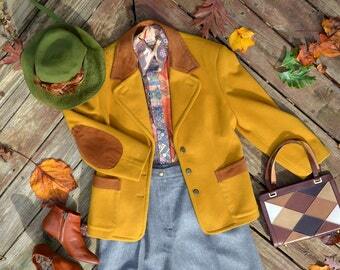 Grab this matching autumn outfit in the shop today! Items priced @$65 or less! ~ There's a crispness in the air that greets the morning sun, a feeling of anticipation, a new day has begun.